Emilia Romagna is known in Italy for its strong culinary tradition. This dish exemplifies all that is delicious about the region, and it's rustic comfort food. It is most typically found in or around the countryside of Bologna. Gramigna literally means "little weeds", it is a curly looking kind of egg pasta that is not easily found outside of the region, but you can substitute dried cavatappi or casarecce with good results if you need to. 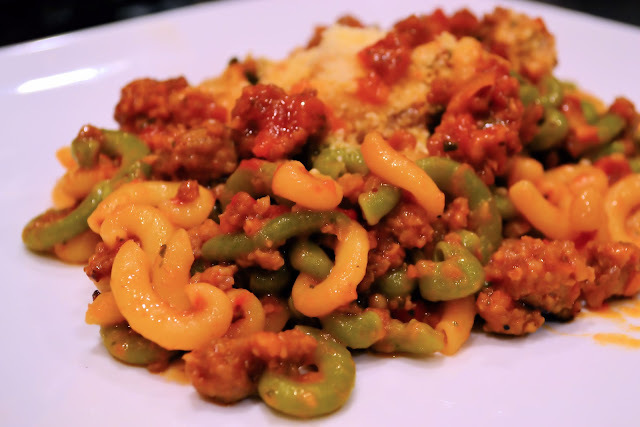 The nice thing about the sausage ragu is that it can easily be prepared in advance and reheated. Perfect for a cold winter evening, it never disappoints. In a large skillet, brown the sausage meat which you will remove from its casing. 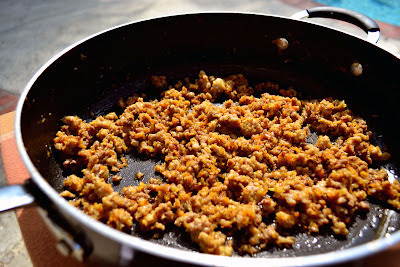 As the sausage is browning, break it apart into small pieces as you stir with a wooden spoon. This should take about 15 minutes. Then, remove the sausage from the pan with a slotted spoon and set aside. Leave the drippings in the pan. Next add the olive oil to the skillet keeping the heat to medium. Add the carrot, onion, garlic, and parsley, and saute for about 10 minutes, until the vegetables begin to brown and become golden. Next, add the sausage back into to pan with the sage, stir for a few minutes. Then, add the tomato paste and the wine. Bring to a low boil, stirring often for about 10 minutes. Reduce the heat to a simmer, and leave the sauce mostly unattended for another 10-15 minutes. Stirring occasionally. Finally, add the chopped tomatoes (either fresh or from a can), and bring the sauce back to a boil. Return to simmer and stir often for about 5-10 minutes. You probably don't need to add salt, but do taste to check for seasoning. While the sauce is simmering, bring a large pot of salted water to a strong boil. Drop in the pasta, and cook according to package directions or desired doneness. It should be al dente. When pasta is done drain it in a colander. Once the sauce is ready, Add the pasta to the skillet along with about half of the grated parmigiano reggiano cheese. Toss to combine completely. Then serve your pasta family style in a large serving dish, or in individual pasta bowls, with the remaining cheese dusted on top. Serve with a nice warm baguette to enjoy with any remaining sauce, and a nice bottle of red wine such as a sangiovese or chianti. This recipe is somewhat hard to define,because it contains meat and vegetable and it could either be an antipasto or an excellent main course. Zucchini is another incredibly versatile vegetable. I can think of at least five or six different ways of cooking them in an exquisite and tasty way. You can obviously fry zucchini, saute them, you can mince them and make an incredible risotto, the possibilities are endless. I wanted to introduce this specific recipe because I thought that the combination on vegetable and meat has always given me great satisfaction. The first step is to hollow the zucchini with a sharp knife. Make sure to make the hole inside a good size, so the meat filling can fit well. 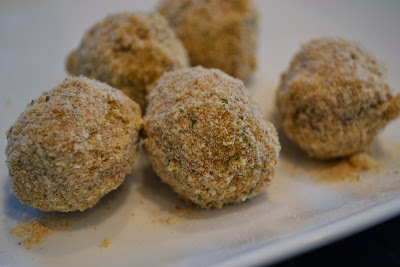 Then, in a bowl, combine the ground veal and pork, eggs, boiled potato, Parmesan cheese, grated nutmeg, salt and pepper. Next we will stir the mixture. Meanwhile you need to prepare the tomato sauce in a pan. First put a little olive oil, then add the finely chopped onions and the chopped tomatoes. Season with salt. Th final step is to stuff the zucchini with the mixture of meat and add it to the skillet with the tomato sauce. Cook for about 15 to 20 minutes. Serve hot. 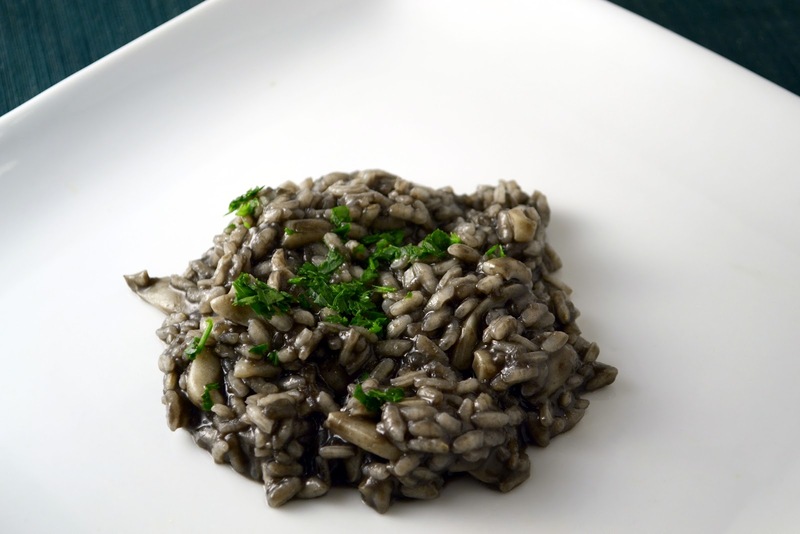 Risotto has always been a very interesting dish to cook, because as in many other Italian dishes, one can be very creative in using different ingredients and combinations. My "comfort food" type of risotto has always been risotto with peas, easy to make and very tasty. However, since I came from a traditional seafood oriented city, there are a lot of variations that are worth mentioning. Many restaurants located along the Italian coast create incredibly tasty seafood risotto. The beauty of it is that you can use the fresh seafood locally found and use it as a main ingredient. Some of these restaurants have been doing it for such a long time that they have a long tradition. Trying to replicate their recipes is virtually impossible. It is worth mentioning that this particular staple is relatively new to Italy, where in asian countries rice has been grown and consumed for about 7000 years and is still nowadays one of the major components of asian cuisine. Today I 'd like to introduce an interesting variation of risotto, made with cuttlefish and squid ink, hence the black coloration in the final result. The black ink doesn't give out significant flavor to the final product, but the cuttlesfish tastes really good and pleasing for those who are really into seafood. Before beginning to cook the risotto, bring about 3 quarts of water to a boil, and and drop the peeled onion and half carrot inside. This is to serve as the broth you will use to cook the risotto. Let it continue to boil as you prepare the rest of the ingredients. After about 20 minutes, reduce it to a simmer. To make the risotto, in a large saute pan, heat the olive oil. When the olive oil is nice and hot, add the diced onion and stir it occasionally until the onion is soft, about 5-10 minutes. Next, add the rice to the onion/olive oil mixture, and let it brown for about 2 minutes, stirring nearly constantly. At this point you are ready to add the two packets of squid ink and the pound of cuttlefish, which you will have cleaned and cut into strips a little less than a centimeter wide. Stir to combine. Now you will add the cup of wine to the mixture, along with the broth you made with the onion and carrot. Ladle the broth into the mixture until the rice is just covered. Continue stirring pretty much constantly for about 15 minutes. As cooking liquid is absorbed, add more broth as needed. Continue stirring and cooking until the rice is soft, but not mushy. It should be al dente. When the rice is nearly done, season to taste with salt and pepper, and stir in the butter and parsley. Your risotto is now ready to serve. This dish pairs particularly well with a nice prosecco, or other dry sparkling wine you prefer. Buon Appetito! Enjoy! Brasato di manzo simply means braised beef in Italian. Nothing can be more comforting or satisfying than a delicious piece of meat that has slowly tenderized after hours of simmering. This is the perfect meal to enjoy on a chilly winter day, or any time you have a need for rustic cuisine. When I prepare this dish, I like to braise the meat for about 3 hours, until it is perfectly tender and delightful. And while I look forward to the meal to come as the cooking aroma fills the house, just as wonderful as the main course is the leftovers to follow. 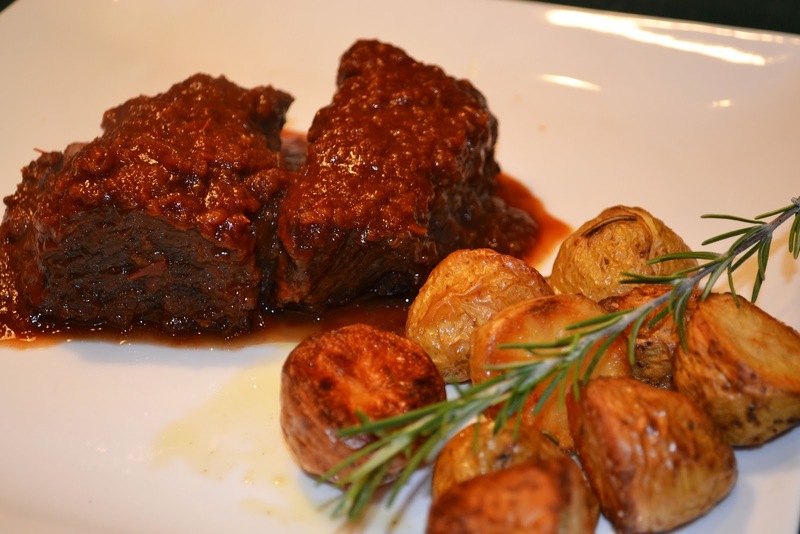 I usually serve the short ribs with some oven roasted fingerling potatoes as a side dish. Luckily, there is always lots of sauce/braising liquid left over at the end. 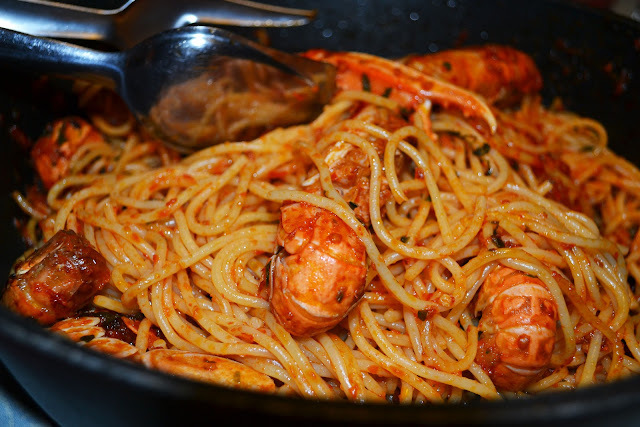 For a future meal, you can reduce the braising liquid to a nice consistency for a pasta sauce. Cut up any leftover short ribs into small pieces, and add it to the sauce. Serve over a nice egg pasta such as pappardelle with a generous dusting of Parmigiano Reggiano on top. Can't be beat! 1 28 oz. can crushed or chopped tomatoes. I prefer crushed. 1 bottle Italian red wine, a Sangiovese works well. Before cooking, generously season your short ribs with salt and pepper. In a 5.5 quart skillet, or other similar size cooking vessel, heat the olive oil until very hot. Brown the short ribs on all sides. This should take about 10 minutes. Once ribs have a nice sear, remove them from the skillet, and set aside. In the same sauce pan, keep the heat high, and add the diced carrot, onion, and celery. Stir often until they soften and begin to take on a nice golden color, probably about 5 minutes. When they look ready, add the can of crushed tomatoes, the bottle of wine and the rosemary. I chop the rosemary finely. Stir well, being sure that all the ingredients combine. When sauce comes to a boil, I often choose to add a little bit of sugar, maybe two tablespoons, to take away any unwanted acidity from the tomatoes. Next, return the short ribs to the skillet, and pour in the beef stock until the ribs are just about covered. Once the liquid comes to a boil, reduce the heat to a low simmer. Cover the skillet and allow the ribs to simmer for about three hours. Stir occasionally. The meat should become very, very tender. Once the meat has cooked for the necessary amount of time, remove it from the skillet and set aside. Then, leaving the sauce uncovered, turn the heat up, and allow it reduce to a nice thick consistency. Right before serving, return the ribs to the sauce for a few minutes to reheat. Then serve the short rib on a plate with a generous helping of sauce on top. As I said, roasted fingerling potatoes are a great accompaniment. Also, a nice baguette is perfect for sweeping up any remaining sauce. Don't forget to treat yourself to a nice bottle of red wine to go with. You could stick to a nice Sangiovese, or go for a nice Brunello di Montalcino. Most importantly, once the meal is over, and the leftover sauce is cooled, put it away and save it for your future meal as a sauce over pappardelle. Seafood had always been a passion of mine and a costant presence in my family cooking. Besides being, for the most part, healthy and fairly simple to cook, seafood allows a certain degree of creativity and versatility. 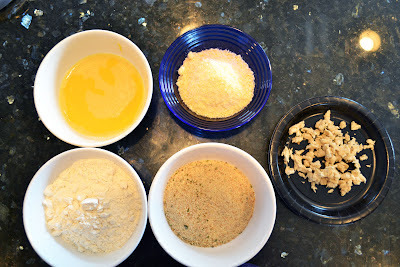 One element of cooking that I particularly value and enjoy is the simple ingredients and the way of cooking them. This finds its root in very poor generations of families during war times and other periods of economic depression, where families had to use ingredients found locally at a very cheap price. By default these ingredients had to be extremely fresh. These two elements, in my opinion, happen to be two golden rules of successful and delicious recipes, fresh and local ingredients. This is particularly true with the recipe I chose today. In fact I found it very "interesting" for a lack of a better word, how traditional poor people food, so tasty and authentic, got so "glamorous" and "trendy" in so many restaurants worldwide. Cornmeal should not be very expensive at all, but call it "polenta" and it assumes a whole different connotation. I think this phenomena has affected the wine culture as well, where something so simple and enjoyable, became "trendy" and, as a consequence, more expensive. 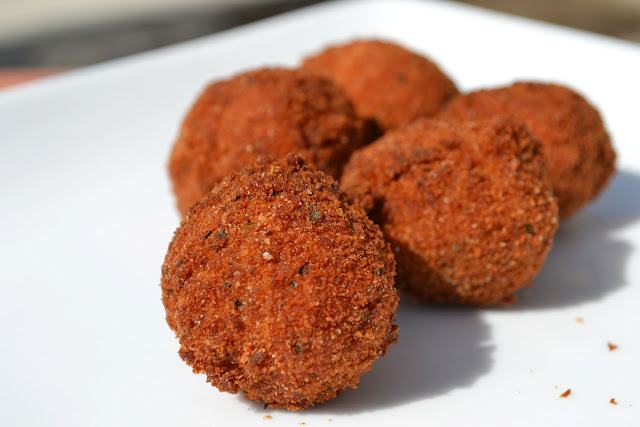 In many Venetian restaurants seppie are very popular prepared grilled, cooked with risotto with black ink ( coming soon here) and, of course, with tomato sauce and polenta. After having cleaned the cuttlefish, cut them into strips no larger than half an inch thick. In a large pot simmer the oil together with the garlic clove finely minced and the onion, until both are of a golden color. Next add the cuttlefish and let them cook covered at a medium temperature for about 5 minutes, until they release some juice. Add the white wine and let it simmer for another two minutes. Finally, add the tomatoes and let it cook for another 15 minutes. If the sauce dries up fast, add the a little water, but the consistency at the end should not be too liquid. For the polenta, many people reccomend the white one. I chose the yellow one, because I like the taste and it adds a nice color contrast to the presentation. The traditional method for making polenta involves cooking it slowly on the stovetop until it thickens to the appropriate texture. This method requires constant stirring to avoid having the polenta stick to the pot. Start by boiling water in a deep pot, pouring a spoonful of salt. Next drop the flour stirring constantly with a whisk. When everything is dissolved and homogeneous, cook stirring constantly for about an hour with a special wooden stick and lifting the polenta from the bottom up. 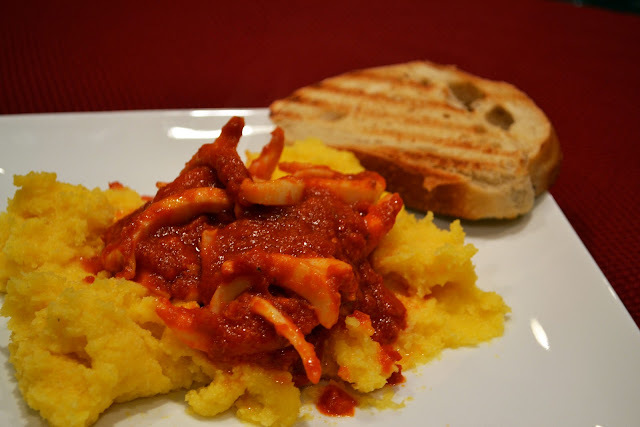 The polenta is cooked when the edges begin to peel off. If it becomes too thick during cooking, add a little boiling water. Pour the cooked polenta into the appropriate platter and serve hot. You can also buy ready made polenta at the store and the mixing process would be much faster. Pair up with a nice white wine of your choice.